WASHINGTON—As part of the office’s annual assessment of the safety and sanitation of the nation’s water supply, the Environmental Protection Agency released Tuesday a list of all municipalities in the U.S. where the tap water is likely fine to drink but tastes sorta odd. 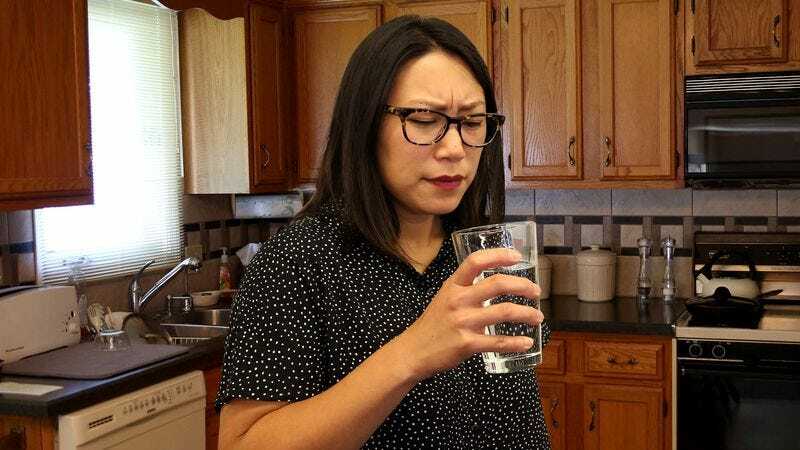 “Although the drinking water from the locations on this list fall within safe pH levels and all tested negative for any disease-causing bacteria and contaminants, we found that when you drink a glass straight from the faucet, something doesn’t taste quite right,” said EPA spokesperson Lianne Blenheim, who explained that despite undergoing proper distillation, desalination, and purification procedures, the water from these areas carries a bit of a funky, sulfury flavor or tastes like “someone’s been soaking old pennies in it.” “We double-checked to make sure the tap water in these locations contained the proper amounts of chlorine and fluoride and that any fungi and algae had been filtered out, but they still kinda tasted a little like bleach, or dirt, or in some cases, even weirdly sweet. You probably won’t notice if you have water from these cities with some food, but on its own, you’ll definitely take a sip and be like ‘oh yeah, there’s something off about this.’” Blenheim then recommended that residents of the identified cities add a squeeze of lemon to cover up the taste or drink their whole glass in one go so they get the weird flavor over with quickly.